These amazing chocolates will surprise and delight even the most discriminating chocolate lovers. Southern California's premier artisan chocolatier, Chuao, strives to create unique flavor combinations using Non-GMO ingredients and crafted with Fair Trade Certified cacao. 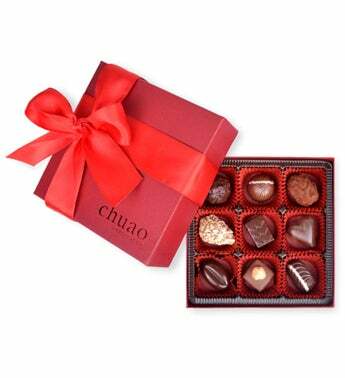 This signature 9 piece box features handcrafted chocolate bon bons in Chef Michael's favorite flavors including Firecracker Truffle, Strawberry Seduction, and Hazelnut Latte. Almond Truffle: Almond hazelnut praline rolled in sliced, caramelized almonds & pistachios in milk chocolate. Contains tree nuts, dairy. Firecracker Truffle: Chipotle caramel fudge, sea salt and popping candy in dark chocolate. Contains dairy. Hazelnut Latte: Roasted hazelnuts blended with fresh vanilla and a hint of coffee. Contains tree nuts, dairy. Mocha: A rich coffee buttercream inside a coffee bean shaped dark chocolate bonbon. Contains dairy, alcohol. Savory Salt Caramel: Salt butter caramel infused with fresh rosemary in milk chocolate. Contains dairy. Salted Chocolate Crunch: Toasted panko breadcrumbs, olive oil ganache and a sprinkle of sea salt in dark chocolate. Contains dairy. Strawberry Seduction: Sweet strawberry caramel with a touch of tangy balsamic in dark chocolate. Contains dairy. Sweet Passion: Exotic passion fruit cooked into soft caramel in a milk chocolate heart shell. Contains dairy. Wild Truffle: Dark chocolate ganache rolled in cocoa powder. Contains dairy. Gift Measures 6" x 6" x 2.5"